I took this image at the Metropolitan Arts Centre (MAC) in Belfast. 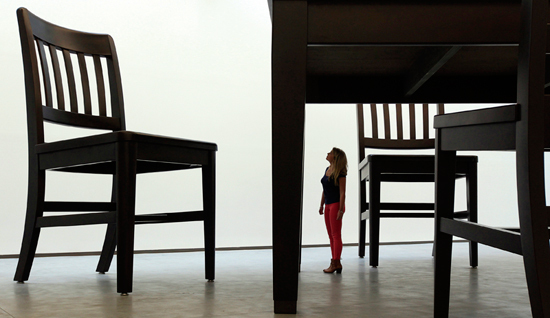 It is an art installation of a giant table and four chairs by the American artist Robert Therrien, who is renowned for his giant sculptures of everyday objects. The installation stands at nearly 10ft (3m) tall and is three times the size of the originals. I had seen a news bulletin about the exhibition on the television and immediately knew it would make an interesting image. Even watching television can be research, as I’m constantly thinking up ideas for possible photographs. In my view, to be a successful photographer you have to be switched on all the time and always be looking for pictures. This process of seeking out pictures becomes part of your life, so in that sense you’re always working. I went to the MAC soon after I’d seen the news bulletin to take a closer look. I wanted to make sure there wouldn’t be too many people walking around as this would have ruined the shot, so I waited until a little after the exhibition had opened for the main rush to die down. I had a clear idea in my mind of what the picture would look like before I reached the venue. As I’ve explained to readers in past Photo Insights, when events are unfolding rapidly there often isn’t time for previsualisation, but this was one of those occasions when I could actually visualise my shot beforehand. I spoke to the press officer to explain who I was and asked if I could take pictures inside the space. They were more than happy for me to do this, as they wanted publicity for the exhibition and venue. I walked around the installation several times looking at it from different angles to see what would work best. In terms of composing and framing the image, there were several factors to consider, one of which was to ensure that the background was free from distracting elements such as windows and stairs. Once I’d found the angle I wanted to shoot from, it was then just a case of waiting for a person to walk into the shot and stand where I wanted. The woman is a crucial part of the composition because she adds a sense of scale. Without her you wouldn’t be able to tell how big these chairs actually are. The fact she is looking upwards also helps to reinforce this dramatic sense of scale. There are only two places where a person could stand in the scene where he or she doesn’t ‘clash’ with the installation – either side of the central table leg. If I remember correctly, I was shooting from just below normal eye level and shooting upwards ever so slightly. The table leg in the centre of the picture divides the frame directly in two, which gives the image a sense of stability – in a way, the line anchors the composition. All the other elements in the frame relate to this central point. In order for the image to work, it was crucial for this line to be straight. If it had been slightly off centre or at an angle, the picture would have been unbalanced and flawed. Fortunately, I was able to avoid this through careful framing. I took several images of the same scene, but this is the only one that worked. The compositions in the other frames I took were too messy. This may be a simple-looking photograph, but there is more to it than meets the eye, so to speak. If it isn’t taken in a precise way, it simply won’t work. I wanted to retain some detail in the image (if you look closely you can see that the woman and the table and chairs aren’t completely silhouetted – you can still make out the features on the woman’s face for example and the colours of her clothes) so I had to ensure my exposure was spot on. If the image had been underexposed all detail would have been lost, but if I’d overexposed the shot the background would have been completely burnt out. Ensuring my exposure was correct wasn’t difficult to do, but it did require a degree of care and consideration. I needed a fast enough shutter speed to ensure all the lines were sharp, but the room was also a little on the dark side so I had to take this into consideration. However, too slow a shutter speed may have meant a blurred subject if the woman moved, and I didn’t want to use too high an ISO setting as this would have affected the image quality. So, as you can see, there were lots of factors to consider. In the end I set my Canon EOS-1D Mark IV with a 24-70mm lens to 1/30sec at f/5.6, and ISO 800.